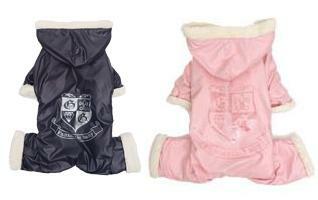 Prepare your dog for the winter with this super warm Puppy Angel Training 4 Legs Padded Vest. Padded Parka has ribbed arm holes a cute white faux fur hood trim and poppers up the chest. The pants are made from soft cotton with side tapes and can be detached from the parka by way of a zip.